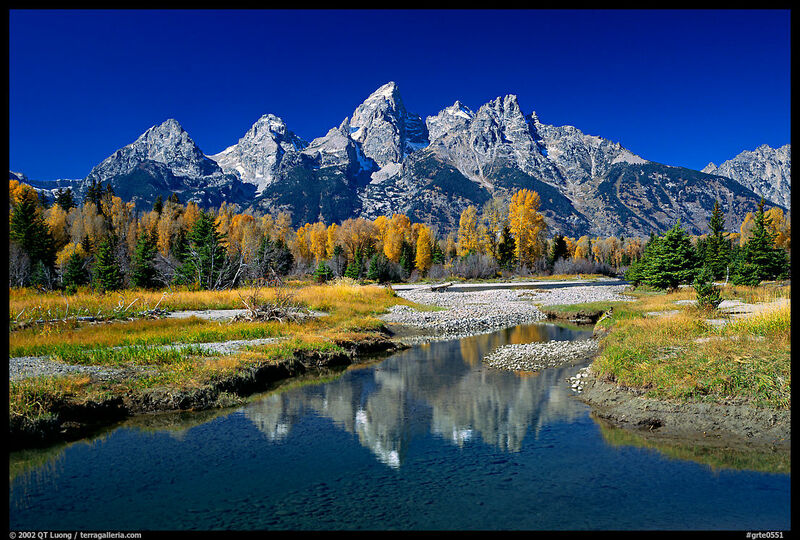 With their tremendous diversity of environments and pristine scenery, the National Parks are a great place – although not always the best – to see and photograph fall foliage color. Here is a guide to fall color highlights in nearly each of the National Parks, which lists the best time to be there to catch the color at its peak. 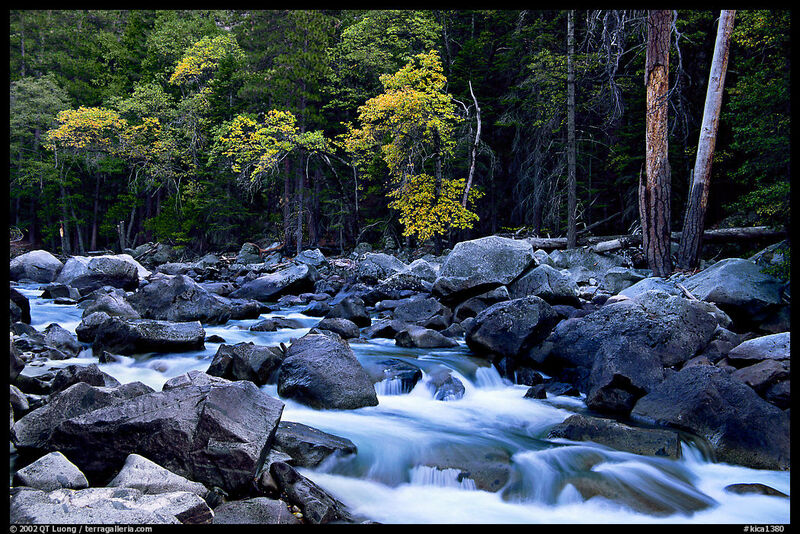 For more photos, see the gallery of images of National Parks Fall color foliage. When one thinks about fall colors, the Eastern parks are the first that come to mind. Rightfully so: the variety of deciduous trees there produce extensive displays of color unmatched in their variety. In particular red maples add a bright accent which is not generally found in western forests. It sometimes feels that every tree in the landscape has turned a different color. The colors start in the Mid-West parks in late September and move progressively South, where they peak in November, with elevation changes causing variations of as much as two weeks. Acadia: This compact park packs a lot of variety. You’ll find in a few other national parks the mix of northern forest evergreens and temperate forest hardwoods, here they grow on steep slopes reflected in ponds and lakes. 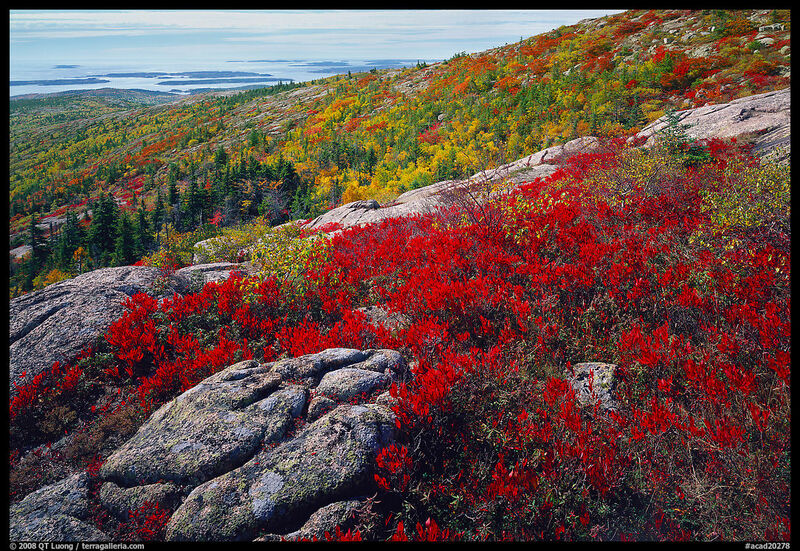 At higher elevations, patches of berry plants, similar to those found on the Alaskan tundra, color red the bare top of Cadillac Mountain. Colors start in late September, peaking by the second week of October, a bit later than latitude would suggest because of the overall lower elevation and coastal location. Shenandoah, Great Smoky Mountains: The Southern Appalachian mountains are home to some of the most varied deciduous forests on the planet, resulting in some of the best foliage displays anywhere. 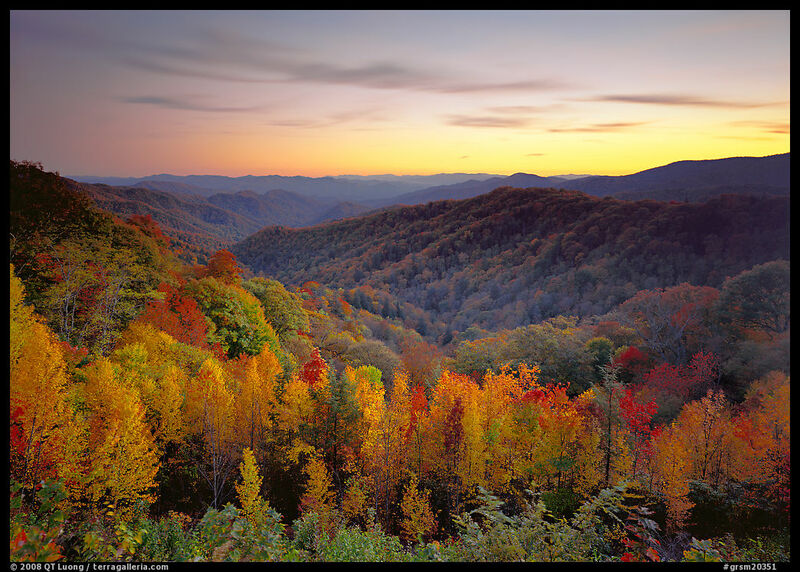 Moreover, the Blue Ridge Mountains offer great ridge-top scenic drives, from the 105 mile-long Skyline Drive in Shenandoah to the Newfound Gap Road in Great Smoky Mountains, with the 469 mile Blue Ridge Parkway in between. The combination of the highest mountains in the Eastern US with the spectacular foliage is difficult to beat. From the numerous overlooks, it is easy to capture vast vistas of kaleidoscopic hillsides and ridges. With the proximity of the Eastern urban centers, those drives are very popular during the foliage season, so it is best to visit during weekdays. Colors are at their best on the two last weeks of October but will be present (depending on elevation) from late September to mid-November. Isle Royale, Voyageurs: Those more northern locations offer a foliage peak in late September, with deciduous trees mixed with northern evergreens. Both parks see very light visitation. The Western end of Isle Royale, near Windigo, has more maples and other deciduous trees than the rest of the island, but like in Voyageurs, there are not too many views outside of the forest. The center and middle of Isle Royale offer to the backpacker extensive views, but they have less color. Hot Springs, Mammoth Cave: Those more southern and lower elevation locations offer a foliage peak that occurs latter than in the Appalachian mountains, at the begining of November, lasting through the middle of the month. Despite being known for other sights (bathhouses and cave), there is also a nice woodland landscape amidst the gentle hilly scenery. Check the Green River Bluff Trail in Mammoth Cave, and the Gulpha Gorge in Hot Springs. Crowds are much thinner than in the better-known parks. 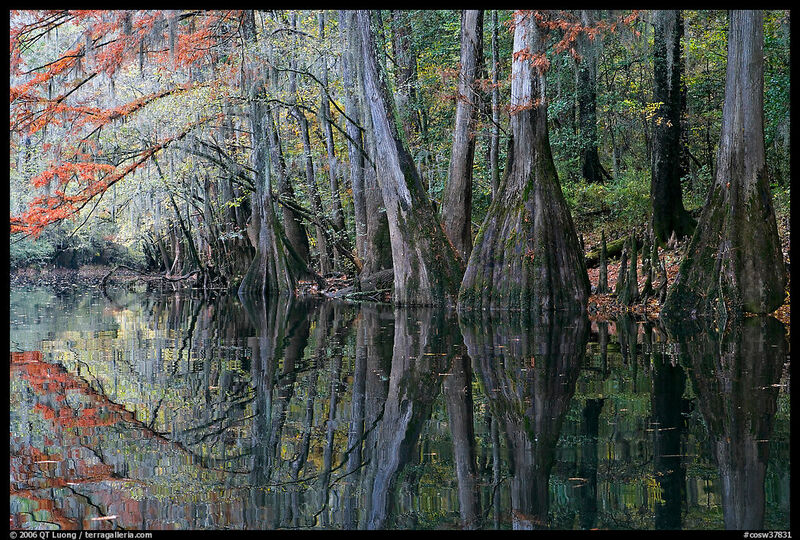 Congaree: The park offers the opportunity to explore a swamp forest in the fall through a very long elevated boardwalk. The abundance of water provides for nice reflections. Although there is no variation in elevation, the various tree species in the park peak at a different time, so some color is to be found anytime from late October to November, with the most interesting foliage color occurring later in the month. Unlike the Eastern mountains, the top of the Rocky mountains are too high and rocky to support deciduous forests, which are rather found in the lower elevation valleys. 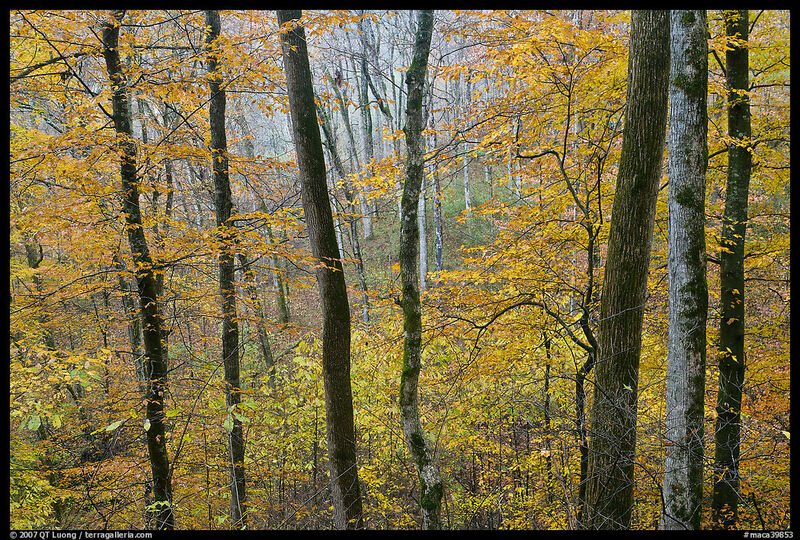 Those forests do not offer the color variety of the Eastern Hardwoods. 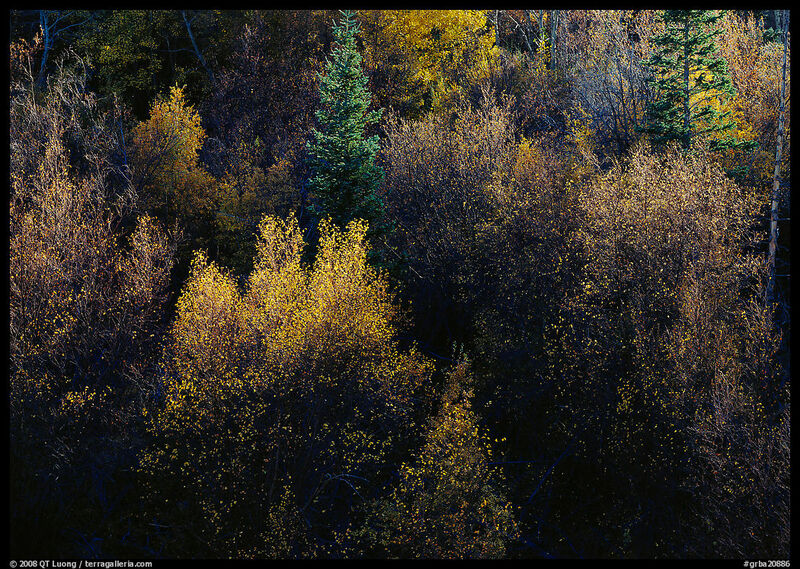 However, the groves of aspen shimmer with an incredibly bright yellow color at their peak – which is much more brief than in the Eastern forest, as high winds can cause all the leaves to fall overnight to the ground. Grand Tetons Spectacular groves of aspen peak in the last two weeks of September, centered in the broad and flat Jackson Hole Valley. 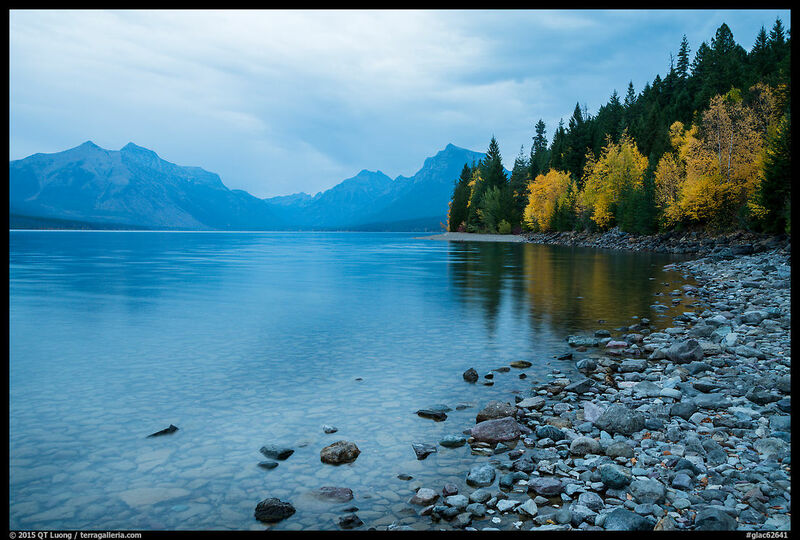 Particularly scenic locations include Jenny Lake, and Oxbow bend, where the trees are reflected in blue waters, with towering peaks in the background. 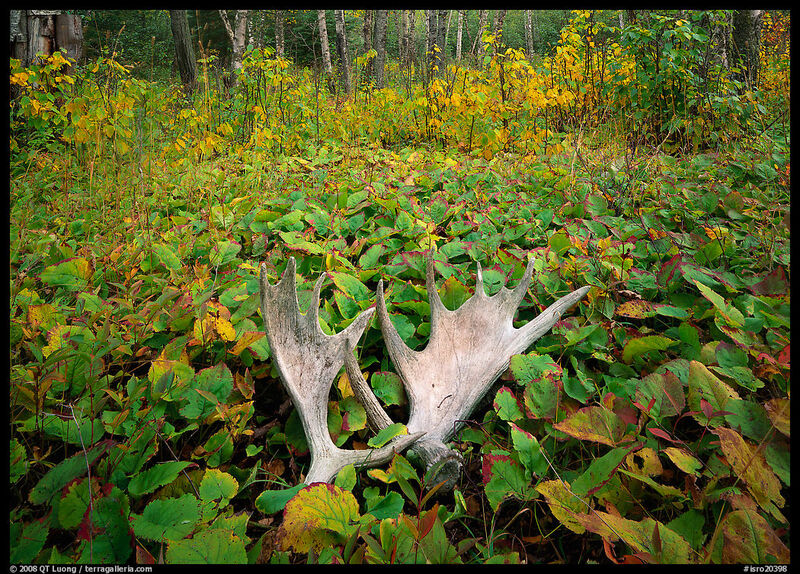 It is also a great time to observe Elk and Moose amongst the crimson brush and willows. Glacier: Fall foliage is found throughout the park, and there is a larger variety of trees than in other Rocky Mountain parks, including Rocky Mountain maple and Western larch. The west side of the park changes color starting in mid-September, with deciduous trees mixed with evergreen, while on the dryer east side, more solid color patches appear towards the end of September. In mid-October, the larch trees growing at higher elevation turn gold. 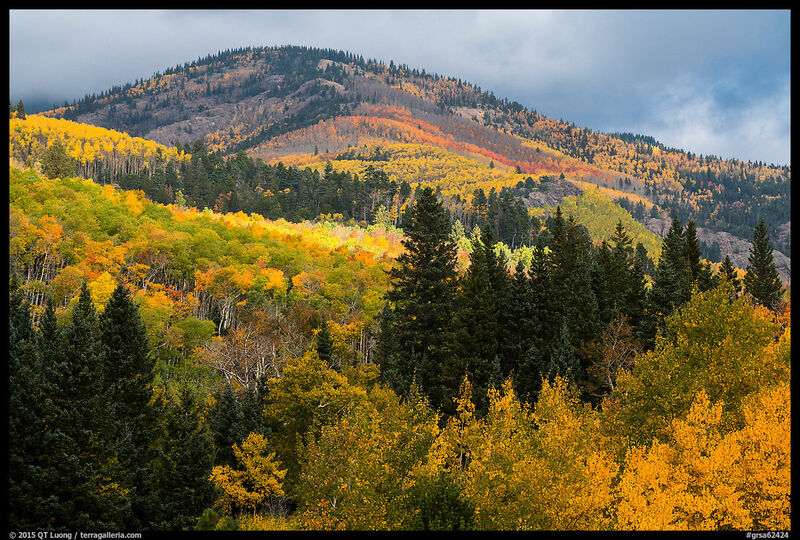 Rocky Mountain: Groves of aspen, alternating with vast stretches evergreens, color the flanks of the mountains at lower elevation during the two last weeks of September. Places to look for color include Glacier Basin, the slopes that border the meadows (locally called “parks”), and opposite the Old Fall River Road. Great Sand Dunes : Cottonwoods grow along the Medano Creek along the dunes. 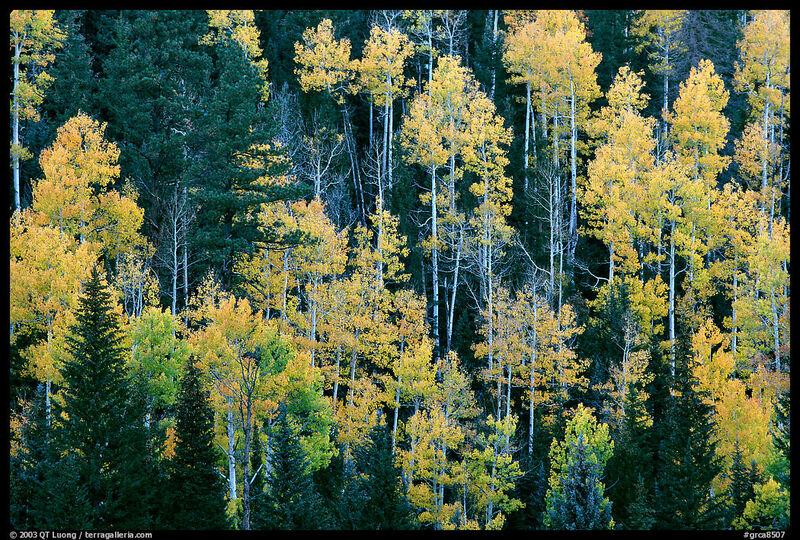 Aspens are found at higher elevations on the Sangre De Cristo Mountains in the National Preserve. They are accessible with a high-clearance 4WD vehicle through the Medano Pass road. Colors peak late September to early October. 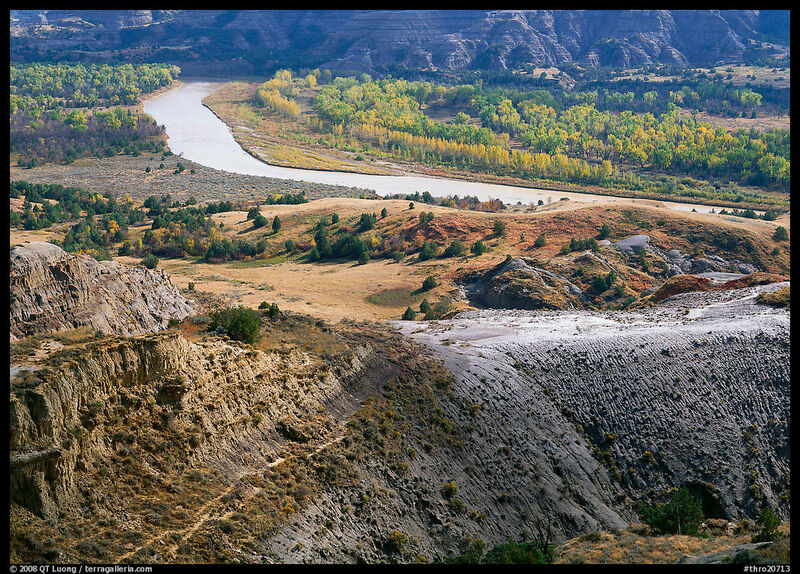 Theodore Roosevelt: Unlike in the barren South Dakota Badlands, trees grow in the rugged North Dakota Badlands. In particular, the shores of the Little Missouri River, in the North Unit, are lined with aspens that turn yellow by the end of September. The Southwest is a desert, which at first does not sound like such a great place to look for trees. Indeed, many of the parks of this area do not feature any significant color, apart from cottonwood trees in washes, canyon bottoms, or along rivers. However, some narrow canyons create micro-climates that sometimes allow a surprising variety of deciduous trees to thrive. 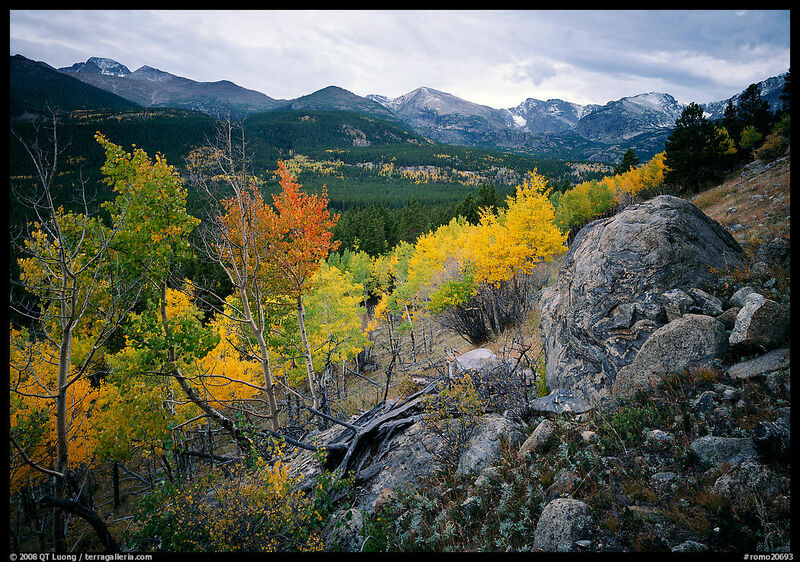 If you add to this the fact that higher elevation plateaus and mountains are often doted with aspens, the icon of the Western fall foliage, some of those parks unexpectedly harbor the most diverse foliage color in the West. 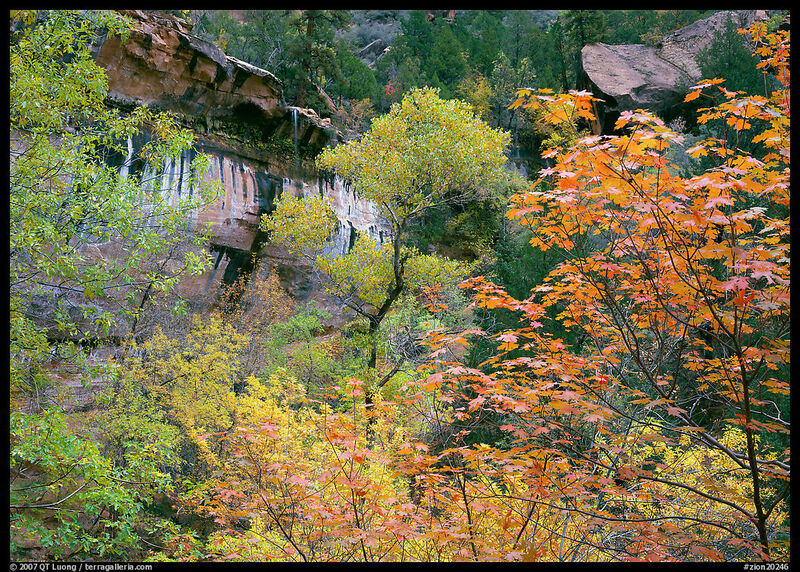 Zion: Thanks to the Virgin River and other streams, Zion is an oasis in the desert. 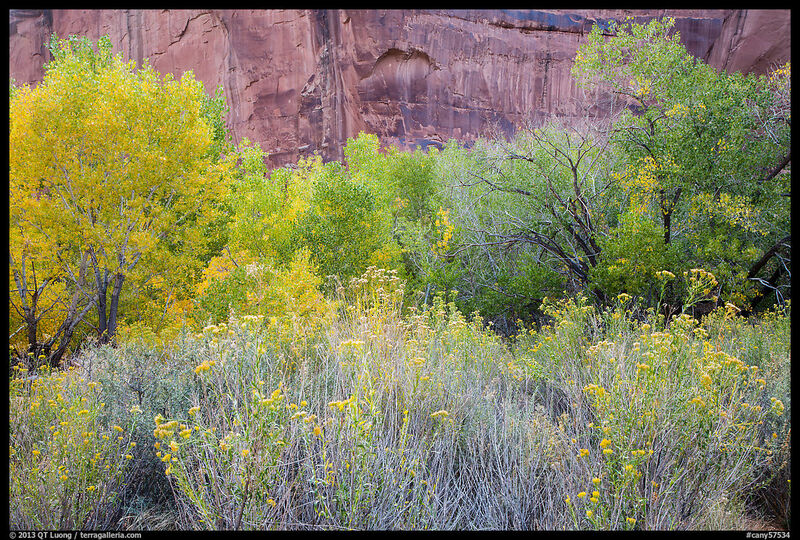 The aspens on the high plateaus turn yellow at the end of September, however the most interesting display occurs later in the deeply shaded canyons. Unlike most of places in the West, red and maple trees grow there, adding a bright touch by late October to early November. The lower water level make it easier to hike the Narrows, where trees grow on the tiny banks of the Virgin River. The Emerald Pool area is another good place to look for varied color. 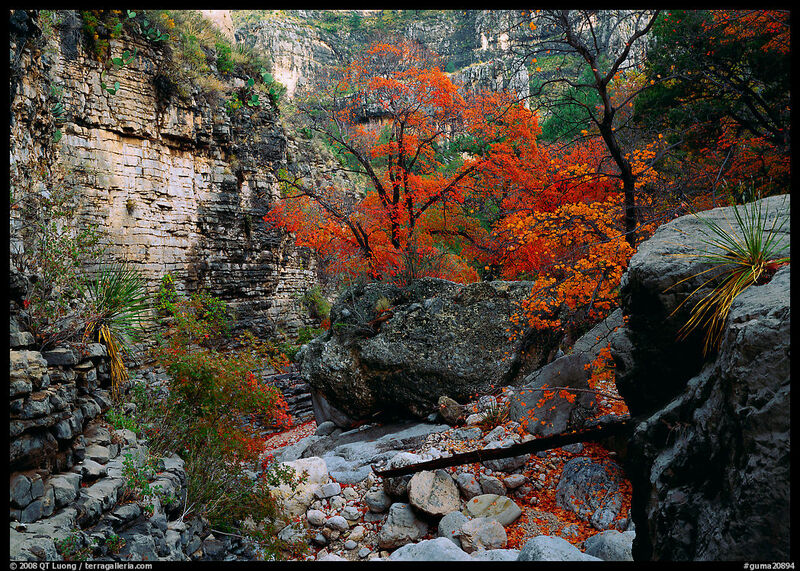 Guadalupe Mountains Within its canyons and oases, in particular, Pine Spring Canyon, McKitterick Canyon, and Smith Springs, a surprisingly large variety of trees with bright red, yellow, and burgundy colors rival the eastern hardwoods. They make an odd juxtaposition with the desert vegetation when the color peaks, at the beginning of November. 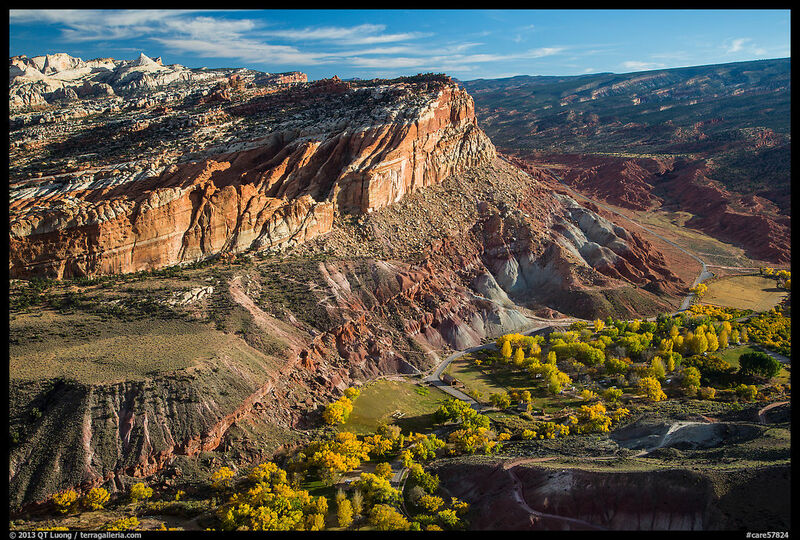 Capitol Reef: Although the park is more known for its variety of geological formations revealed by the bare terrain (fall provides the best conditions for exploring back country roads), it is also an oasis in the desert with the historic orchard at Fruita and cottonwoods along the Freemont river. Their color, which peak in early November, harmonizes with the red sandstone cliffs. 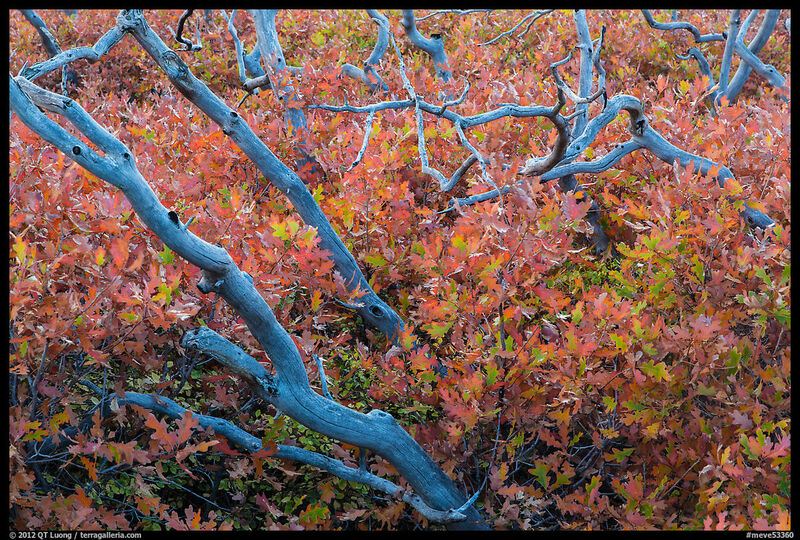 Great Basin: During the last week of September, pockets of aspen groves are found on the upper portion of Wheeler Peak drive, as well as in side canyons such as Windy Canyon. Black Canyon of the Gunnison: Shrubs (such as oak scrub) growing along the rim turn in late September. There are also a few isolated aspen groves along the Oak Flat loop trail and the drive to East Portal. Grand Canyon: While the South Rim vegetation of pines and junipers is not deciduous, the higher North Rim is rimmed with aspens that turn yellow during the second half of September. Mesa Verde: Certainly not a place you’d think about for fall foliage, especially since due to high elevation, the mesas that are home to the ruins are dominated by conifers. However, the mesas at lower elevation, from the park entrance to Far View, are covered with shrubs that unexpectedly turn the whole landscape crimson towards the end of September. Arches: The desert vegetation around the arches is not deciduous, but there is one canyon experience in the park, at Courthouse Wash. 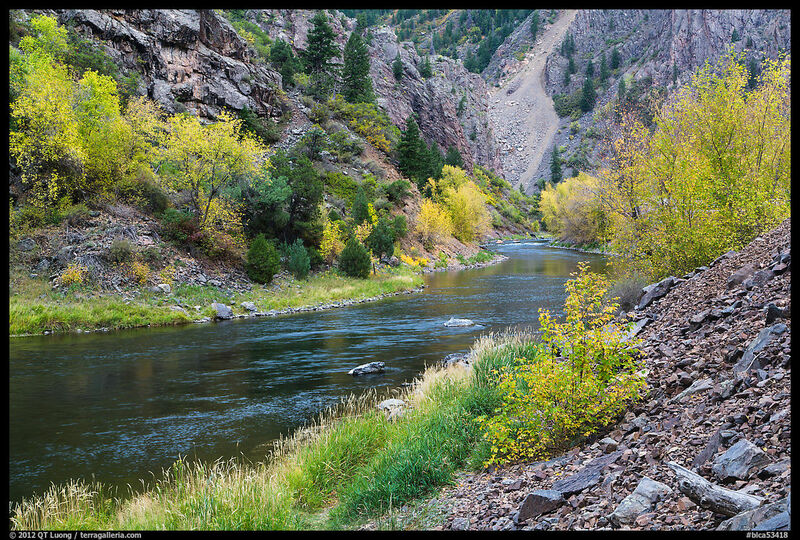 The riparian plant communities along the stream include cottonwoods that peak from late October to early November. You can photograph them from the bridge, but for a much more rewarding experience, follow the wash downstream using a social trail which you are likely to have all to yourself. 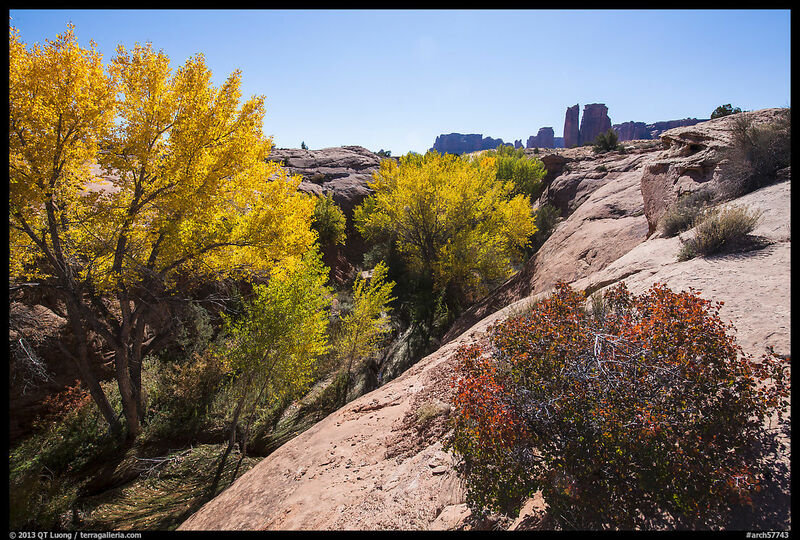 Canyonlands : The desert vegetation on the plateaus is not deciduous. However, the Green and Colorado River are lined up with with riparian plant communities that peak in late October. It is a tough hike or 4WD drive to get to the river, but it is easily accessed by jetboat from Moab. Canyon bottoms such as Horseshoe Canyon and the Maze contain stands of cottonwood trees as well. 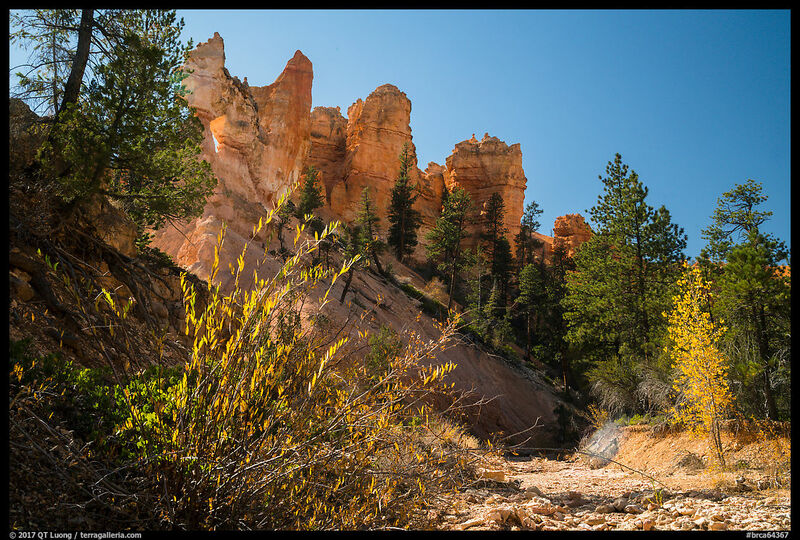 Bryce Canyon: Due to high elevation, the park is dominated by conifers, however, with a lot of hiking, a few pockets of deciduous trees can be found, mostly along the creeks below the rim. The western mountain forests are generally dominated by conifers. In the Sierras, large aspen groves tend to grow in the dry Eastern flanks, outside of the National Parks, while the same can be said of Western Larch trees in the Cascade Mountains. Tree colors are mostly confined to small pockets. However, at more northern latitudes of Washington, the berry plants can turn the whole ground red at sub-alpine elevations, while at lower elevations vine maples provide orange touches not found in California. 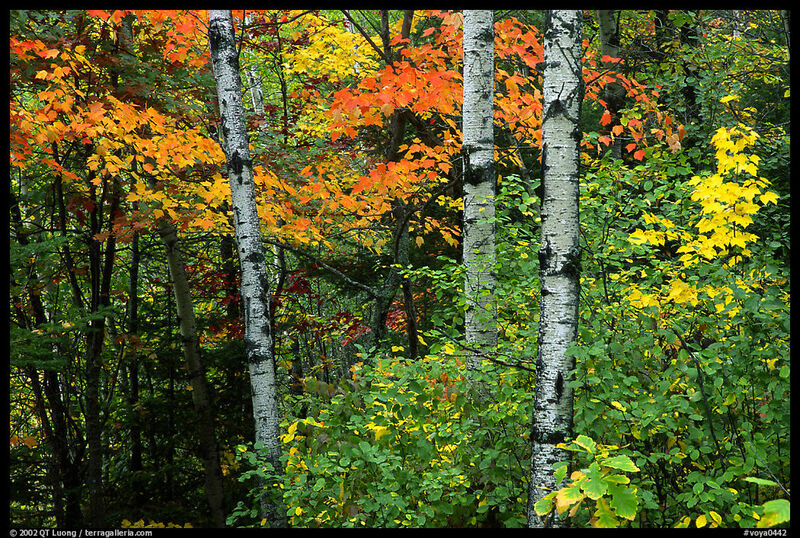 Lower elevation forests comprise deciduous trees that provide brilliant but localized, pockets of color. 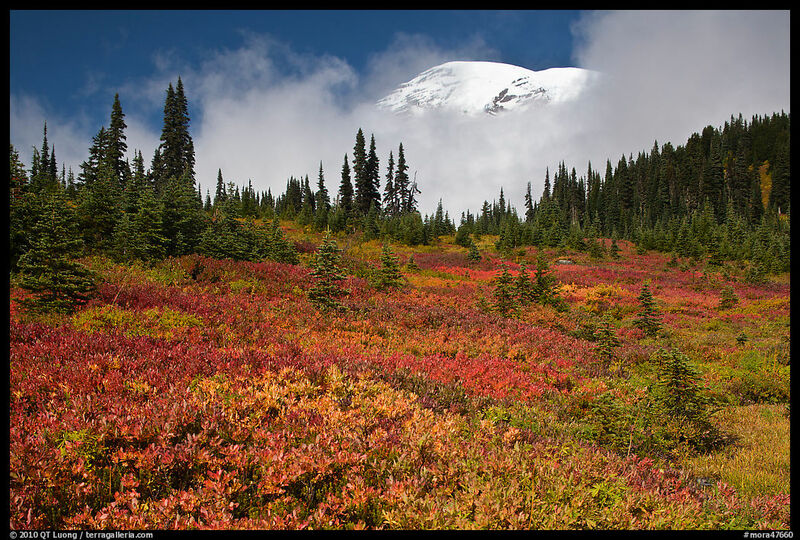 Mount Rainier: Alpine meadows such as Paradise are full of berry plants that peak on the last week of September, rivaling in color the wildflower displays of the summer. Vine maple can be found at lower elevations, for instance along Stevens Canyon. North Cascades: Berry plants at higher elevations, and maple at lower elevations peak on the last week of September. 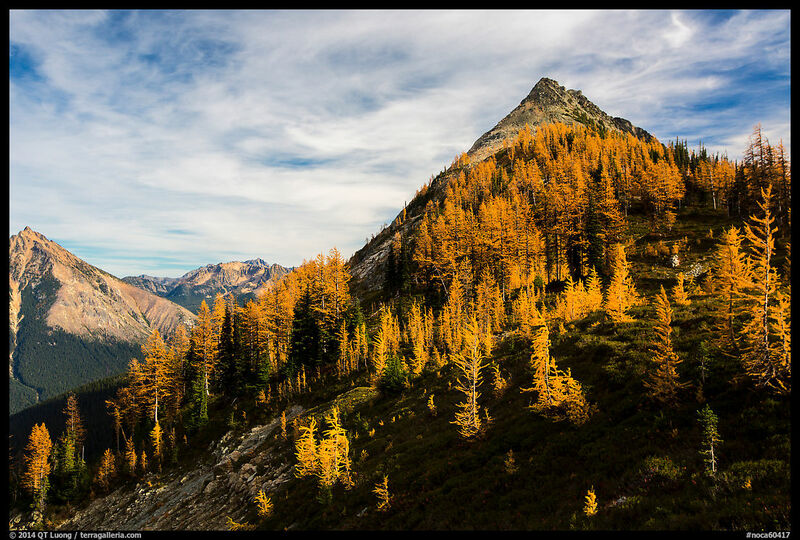 During the month of October, the needles of the Western Larch, a deciduous conifer with a narrow geographic range, found on the eastern side of the park, turn a bright yellow. Olympic: The subalpine meadows are thick with bluberries, whose leaves turn a deep scarlet at the beginning of October. In mid/late October, maples (both bigleaf and vine) add a powerful color accent to the dark west side rain forests. 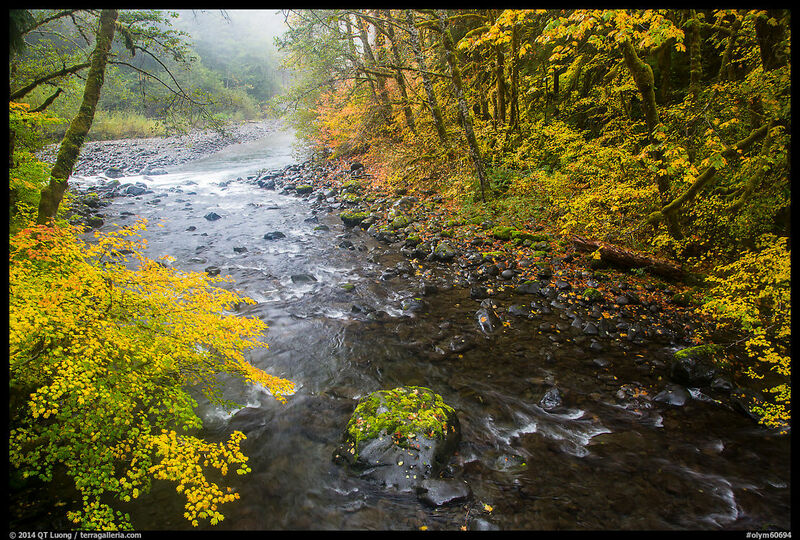 Sol Duc has also beautiful color that can peak a bit later. 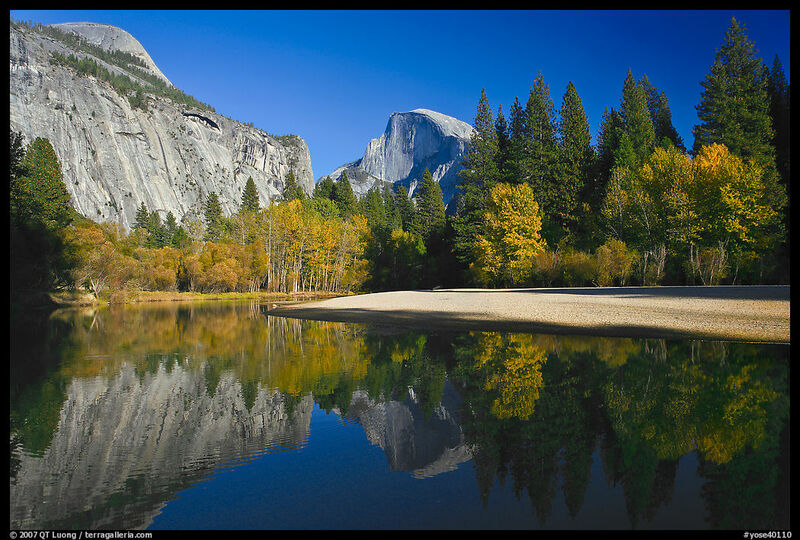 Yosemite: Besides a couple of often-photographed non-native trees, colors in the Valley are mostly provided by yellow maples, red dogwoods (peaking early October) and the oak trees (peaking early November) that line up some meadows, my favorite being El Capitan Meadows. Except for sparse maples and dogwoods, and the berry plants in places such as Siesta Lake, there isn’t much foliage color in the high country. Kings Canyon: The Cedar Grove area of Kings Canyon is somewhat similar to Yosemite Valley, with generally less fall color. Pockets of maples and dogwoods add a color accent to the forests in October. 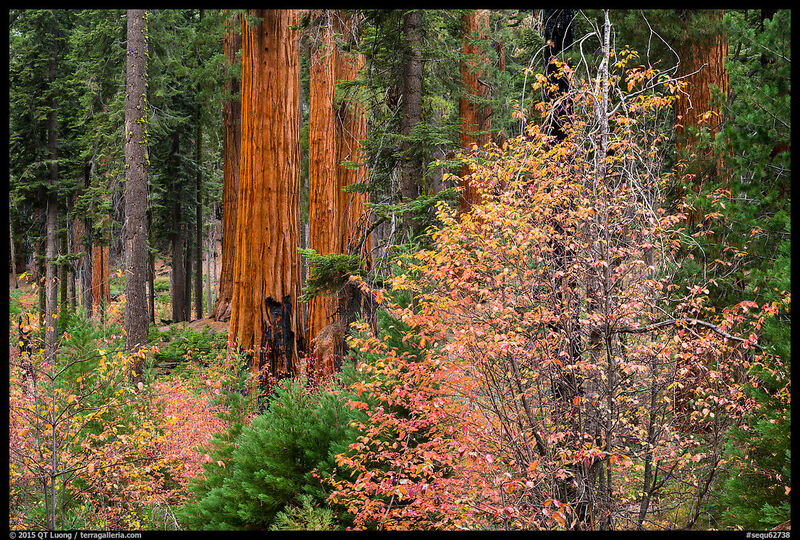 Sequoia: The lower elevation foothills are covered with many blue oak trees that peak in November. In late October, dogwoods add a color accent to the groves, while ferns color the meadows within Giant Forest. 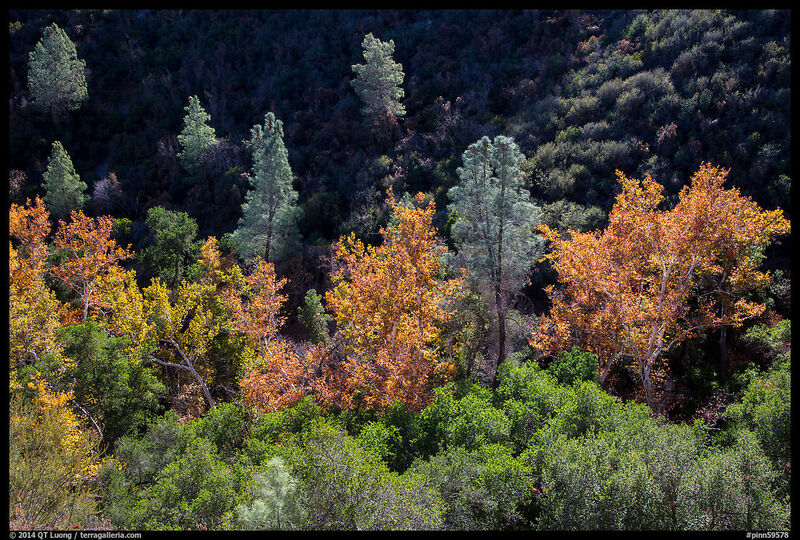 Pinnacles: The park has no large deciduous forests, however good places to look for pockets of colors include Chalone Creek in Bear Valley (cottonwoods) and Bear Gulch between the nature center and Bear Valley (sycamores). At the Arctic circle, spring, summer, and autumn last about one month each, with the rest of the year being winter. 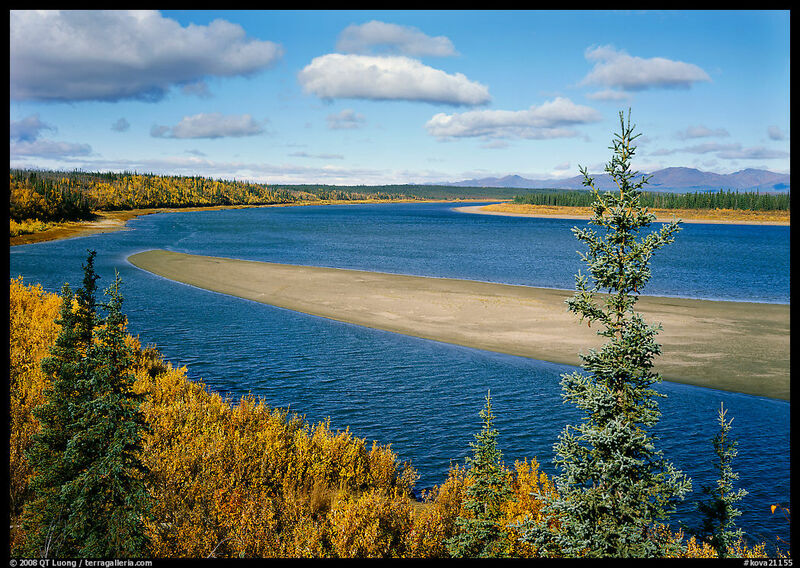 Fall arrives earlier than elsewhere on the continent, as early as mid-August at higher elevations in Gates of the Arctic National Park. What distinguishes the Alaska autumn are the vast expense of tundra. While at more meridional locations, the color is mostly on tree leaves, in Alaska, the entire ground can turn shades of yellow and red. 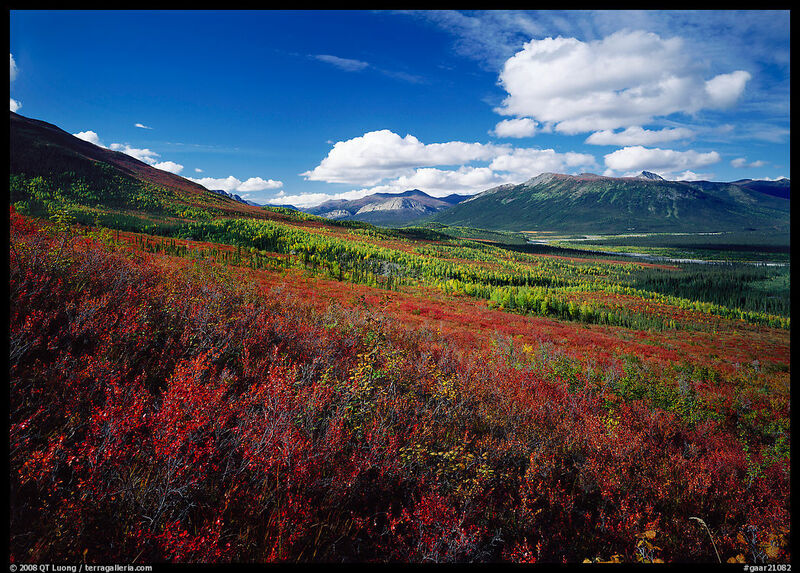 Denali: Autumn comes between the last week of August and the first week of September with particularly spectacular tundra colors, in particular towards the end of the paved road, and past Elieson Visitor center up to Wonder Lake. Look at the tundra to see how the size of the plants diminishes as the elevation increases. The Riley Creek drainage near the entrance of the park has many aspens mixed with evergreens. 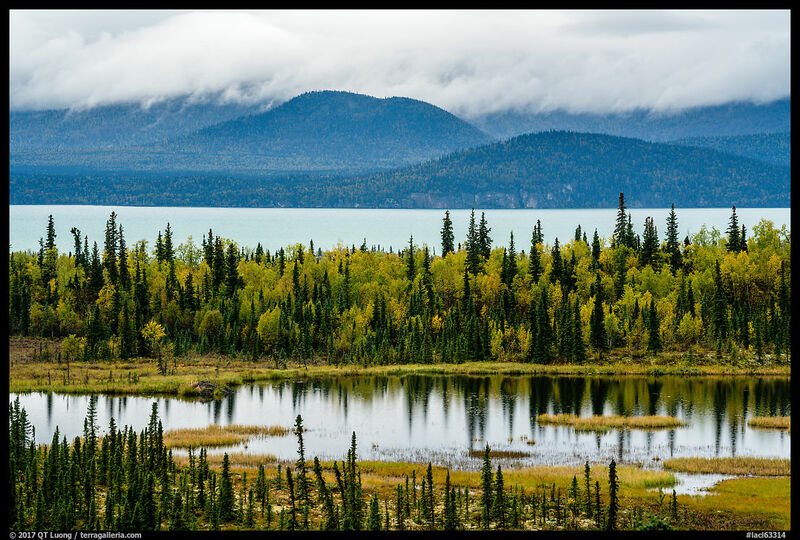 Lake Clark: The eastern part of the park features extensive tundra terrain that turns burgundy in the first week of September, followed by birch trees at lower elevations. However, the weather on the Alaska Peninsula can be quite wet in the fall. 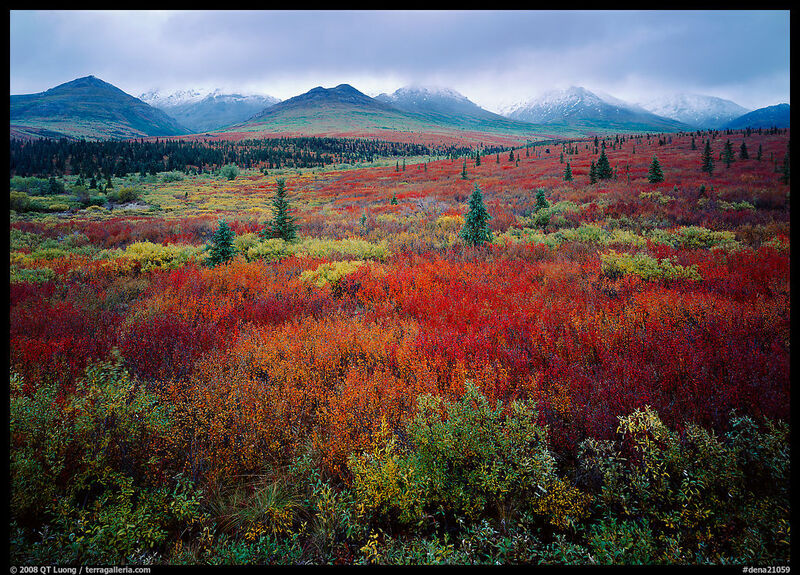 Gates of the Arctic, Kobuk Valley, By mid-August, the tundra turns red at higher elevations, lower elevations (such as the Kobuk River Valley), which also include aspen, peak at the end of the month, which coincides with the fall caribou migration, one of the great wildlife happenings in Alaska. 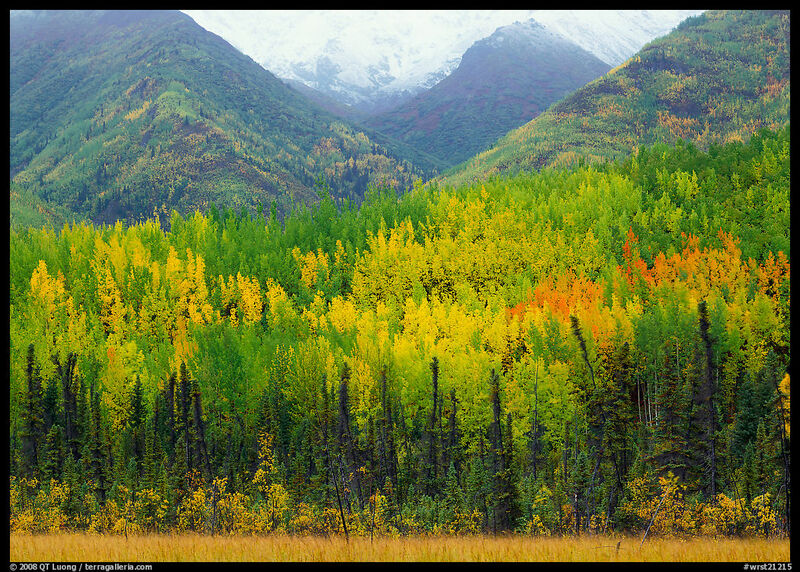 Wrangell-St.Elias: Numerous aspens can be found along the last section of the McCarthy Road, either on mountainsides or in the valley. They turn yellow at the beginning of September. 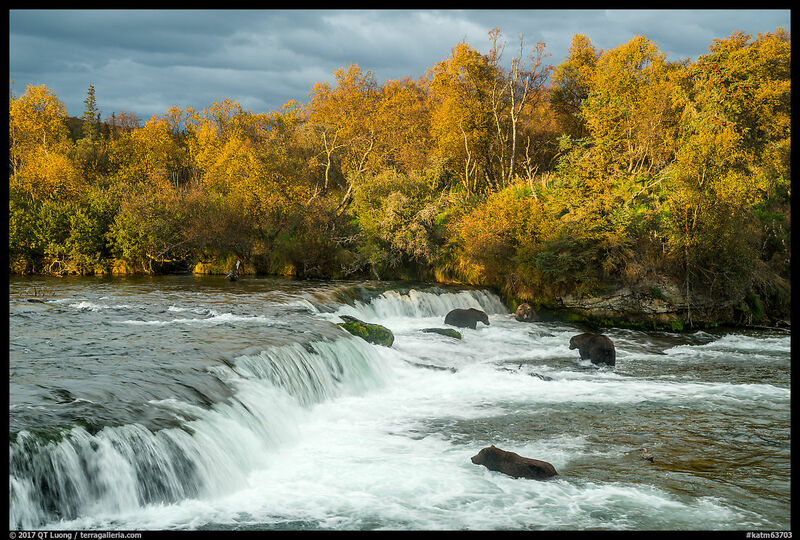 Katmai: Although the Valley of Ten Thousand Smokes is barren, the area around Brooks Camp is riparian with plenty of deciduous vegetation that peak in the middle of September – a good time to see the bears without the crowds. The trail to Dumpling Mountain provides easy access to the tundra that turns at the same time. 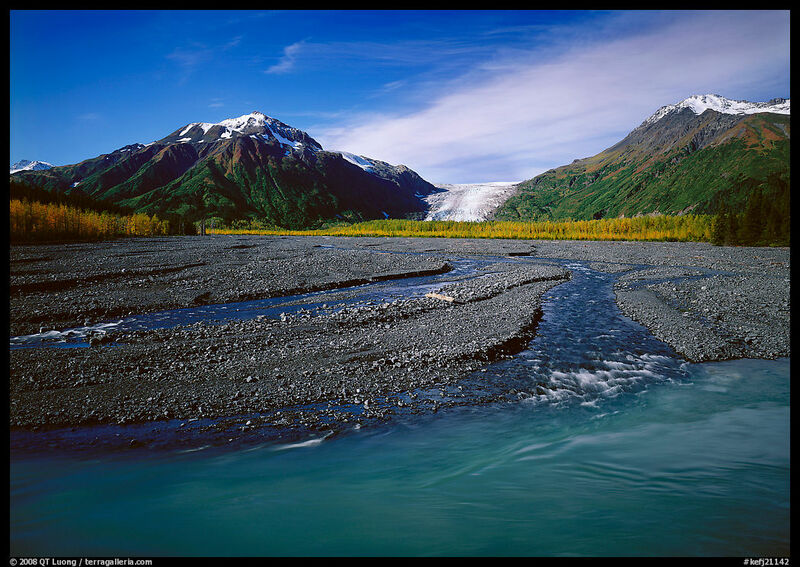 Kenai Fjords: Exit Glacier is one of the most accessible spots in all of Alaska’s national parks, and aspens on the floodplain and at its base turn in early September. See pictures of National Parks Fall color foliage. Any favorites that I missed ? Please comment ! Could you please talk about technical? 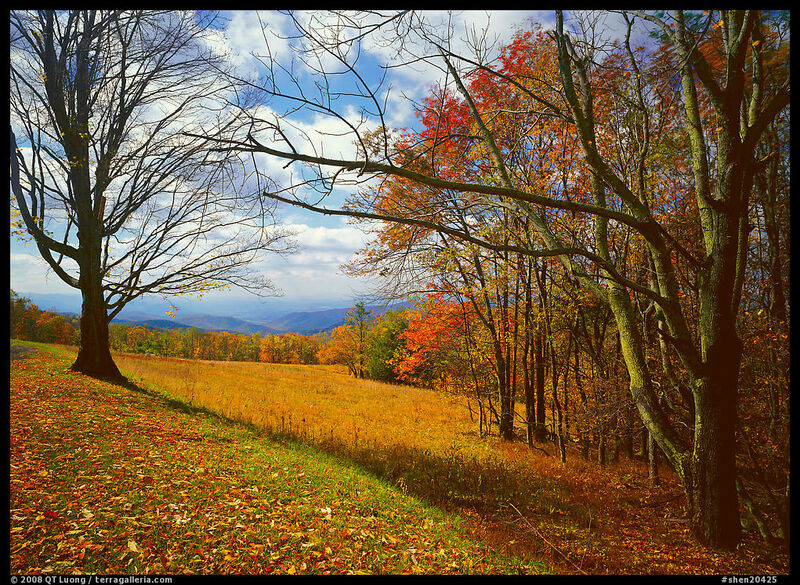 How to create a good color picture for fall foliage. out individually and glow as the light goes through them. Side light works well for grand landscapes with fall color. Direct sun results in large contrast, which can hide subtle differences in color, so softer light is often preferable, especially within the forest. I love the pictures. Outstanding photography work. 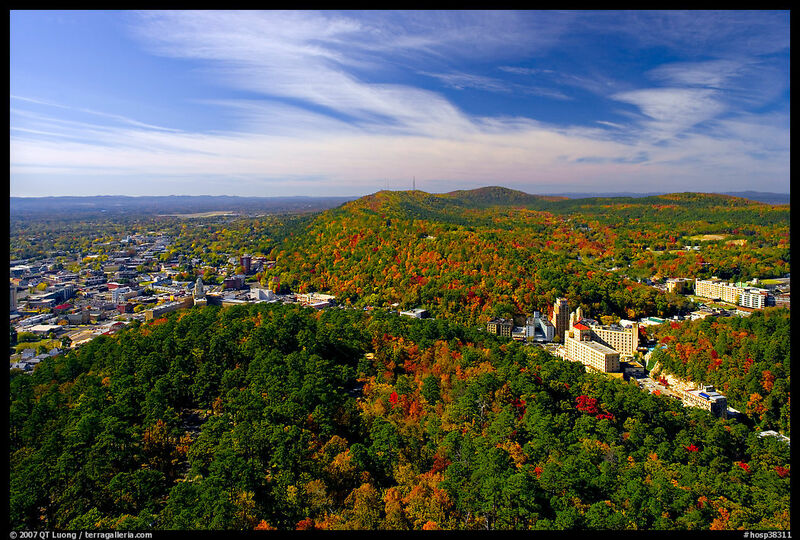 One of the pictures near the top look like Spruce Knob West Virginia. Just included a link to this updated post in our blog about current fall foliage conditions in Acadia National Park. Fall is a lovely time of year in all national parks! This is a tremendous resource for those concentrating on colour in the NPs in particular……I will file this away for future reference . Thanks for the time and effort you put into this.